14 Dec 2016 --- A new study that analyzed the toxic components of proteins in various varieties of wheat has made the first step forward towards developing wheat-based products that are safe for celiacs. Celiac disease, one of the most common autoimmune diseases, causes atrophy in the villus of the intestinal mucosa, which leads not only to poor nutrient absorption but also malnutrition, diarrhoea, stunted growth, anaemia and fatigue. Currently, the only treatment is a strict gluten-free diet for life. In recent years research that seeks to understand the relationship between the proteins of wheat gluten and the reaction it produces in celiacs has been promoted. One of the hypotheses, with no clear scientific basis, was that modern wheat production practices that aim to improve the viscoelasticity of bread dough had contributed to increasing the prevalence of celiac disease since the late 20th century. However, a new study published in the journal 'Food Chemistry' demonstrates that even the oldest varieties of wheat, which have not been subject to alteration, can present toxicity through some components of gluten, called epitopes, that are responsible for the autoimmune response in celiac patients. The scientists analysed various kinds of wheat from several countries, all produced in the same agronomic year (2013-2014) at the Experimental Station at the Agronomic, Food and Biosystems School of Madrid, in order to assess what relationship there was between various kinds of wheat and their toxicity. For this purpose, they focused on some of the proteins in gluten, gliadins. The other proteins in gluten, glutenins, are the main causes of the strength of the mass of flour and what lend it its viscoelasticity. This characteristic, which has a clear genetic component, makes some varieties of wheat more suitable for producing bread, while others are used for patisserie products. However, there are various kinds of gliadins in every variety of wheat. The scientists assessed the presence of T-lymphocytes - a type of cell in the immune system - related to coeliac disease in the various kinds of wheat thanks to an antibody capable of recognising toxic epitopes or antigenic determinants. “The results show that the different varieties of wheat produce considerably different immune responses depending on the T-cells analysed. Some varieties of this grain, such as the French 'Pernel' T. aestivum ssp. vulgareL., have low toxic epitope content,” explains Rodríguez-Quijano. 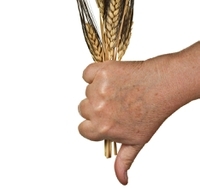 The researchers say the research reveals the potential of production practices to develop wheat products that are safe for celiacs. “For this reason, learning about the different varieties would enable production techniques to be developed to achieve this,” the expert says. The project is a first step towards these technologies based, for example, on selective modification of the glutamine residue present in the toxic components. In celiac disease, identifying the quantity and distribution of toxic epitopes is the key. “We hope this study enables products to be developed that are safe for celiac with detoxification processes that combat the poor nutritional and technological characteristics of gluten-free products and thereby contribute to improving patients' quality of life,” concludes Rodríguez-Quijano.